Personalized Mint Tin Custom Printed in Bulk or Blank. Promotional, Inexpensive. Budget Prices in the USA and Canada. It holds about 1 oz. of sugar free mints. Wholesale advertising hinged Mint Tins on sale. Lowest cost in North America. We also supply blank (not personalized) Mint Tins: see the Price Table below.). Free Artwork Design. American Clients pay no taxes. The unit prices below include you full color custom imprint on a decal, or they are for blank (not custrom printed) Mint Tins. Add $0.25 per unit if you prefer full color imprint directly on the tin. 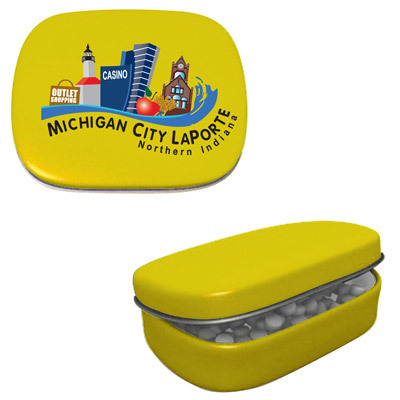 Optional full color direct imprint on the tin box: add $0.25 per unit. PRODUCTION TIME: 3 working days after art approval; Blank (not personalized) Mint Tins ship next day. 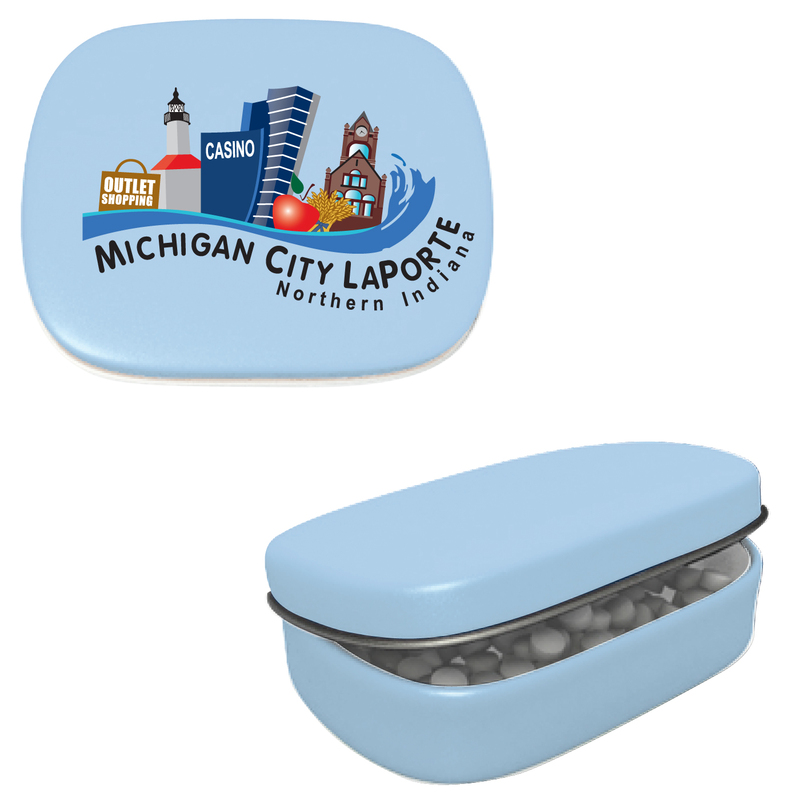 Our new Hinged Mint Tins may be imprinted in full color on a decal, or directly on the tin box (at an aditional cost of $0.25 per unit). It holds approximately 1 oz. of sugar free mints. Colors: Black, Dark Blue, Gray, Green, Light Blue, Metallic Gold, Metallic Silver, Orange, Pink, Purple, Red, Teal, USA Pride, and White.